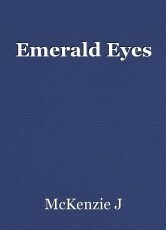 Her emerald eyes glistened with a certain type of fear. Frozen, wide with anticipation and anxiety. I circled her, each step slow and deliberate. I wanted her to shake, I wanted her to wonder what I would do next. The thoughts that must be flying through her mind right now, I hope, could be compared to a twisted wonderland. Where I am the Red Queen and she, my Alice. My prey. Once Im done toying with my precious doll, itll be off with her head! But not yet, no. I cant bear to rip the life from her dreamy emerald eyes. They must be preserved, cherished, put on display! They must be worshipped. They must be mine. Just a little longer now and I can become what I always wanted. I can become my obsession. Her beautiful emerald eyes, still so full of life and expression despite the terror running through her veins. As I came aroun the table, I leaned down and pressed my forhead to hers. Staring into those emerald eyes. I felt her jolt as my icy skin met the heat of hers.